Envoi rapide, engagements respectés, colis particulièrement soigné : impression de qualité ! 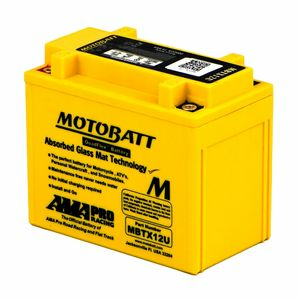 As with all Motobatt batteries this is an awesome piece of kit and highly recommended. The battery is a direct replacement for the YTX12-BS. It is the identical height and width as the MBT12B4 battery which is sometimes recommended for the Triumph America but is deeper by a cm or so. This means that it fits perfectly into the battery tray rather than there being a gap. Only other difference that I could find was that this battery is 14AH rather than the 11AH of the MBT12B4, which in my humble opinion can only be a good thing. Just one note of caution; it is bright yellow. "Duh! Obvious!" you might think but the battery on the Triumph America is not covered and is open to view. There is a chrome battery cover that can be purchased from Triumph aftermarket sites but this doesn't come as standard. Battery arrived very quickly and was very well packaged. Huge improvement over standard battery that was a fair few years old, engine turns over faster, light are brighter and for a 24 year old machine it is more responsive. Good design, with the spacer provided it was perfect fit for my bike. Engine started straight away after fitting.